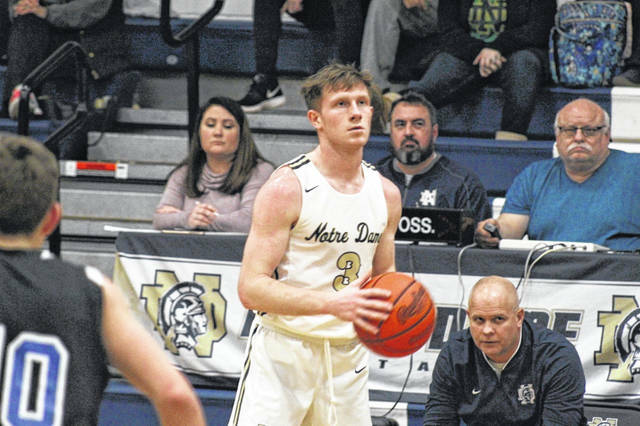 Notre Dame senior Cole Harrell finished with five points in the Titans home win over Rose Hill (Ky.) Saturday. Notre Dame senior Ben Mader scored a game high 21 points in the Titans home win over Rose Hill Saturday, 59-46. PORTSMOUTH – As the regular season slowly winds toward an end, the Notre Dame Titans are still improving, and winning. The last part of that statement came true on Saturday in a home win over the Rose Hill (Ky.) Royals 59-46 as the Titans picked up their second win of the season. Notre Dame did in fact move the ball incredibly well. While the Royals attempted to run a 2-3 zone defense for the majority of the game, it was the Titans who were patient on the offensive end and relied on good decision making and even better passing to get the open looks necessary to win. And even when the Titans happened to miss the open looks they were taking advantage of, they were right there underneath to grab offensive rebounds to generate more chances to get points on the board. The Titans two leading scorers for the season, sophomore Jackson Clark and senior Ben Mader, continued the pace they’ve been on since the season began again on Saturday by scoring a combined 35 of the Titans 59 points. If it doesn’t say enough about Mader’s ability to hit outside shots, 12 of the senior’s 21 points came from behind the arc, contributing four of his teams six made three’s for the game. Going into the final week of regular season play, things don’t get any easier for a Notre Dame team in a loaded SOC I conference. To finish the season, Notre Dame will travel to Green to face the Bobcats on their senior night Tuesday before hosting New Boston Friday night to honor seniors Ben Mader and Cole Harrell. 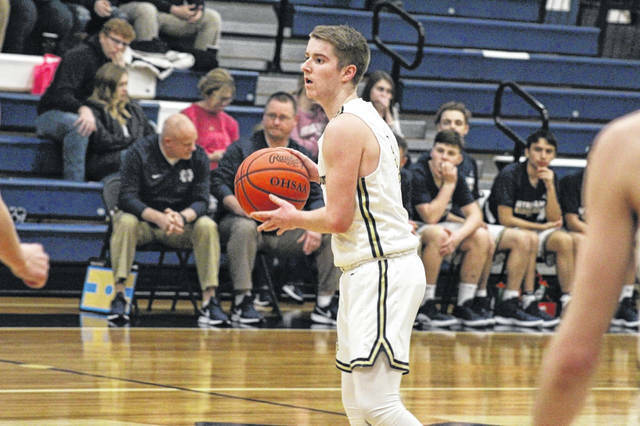 RH: 16 FG, 7 3PT, 9/15 FT.
https://www.portsmouth-dailytimes.com/wp-content/uploads/sites/28/2019/02/web1_harrell.jpgNotre Dame senior Cole Harrell finished with five points in the Titans home win over Rose Hill (Ky.) Saturday. https://www.portsmouth-dailytimes.com/wp-content/uploads/sites/28/2019/02/web1_benmader.jpgNotre Dame senior Ben Mader scored a game high 21 points in the Titans home win over Rose Hill Saturday, 59-46.